This tough little cookie came in with his sibling after what I suspect was either their first flight gone bad or after being blown out of their nest. He was a fully feathered long billed corella. He had massive head trauma and a blood shot eye and could barely lift his head. They both received basic supportive care as we didn’t want to stress them and unfortunately his sibling died. He, however, would not give up. At that stage I could not even send him to a wildlife carer because I was not certain of his prognosis and whether we would ever be able to release him back into the wild. I took him home and put him in with my galah ‘Leilah‘. She had just recently lost her friend ‘Larry‘ who flew away by mistake. I started to crop feed him several times during the day. He was a very demanding little brat and would squak so loudly whenever he was hungry or demanded my presence. Every day I would notice a very small improvement but an improvement none the less. First both his eyes opened up then he was able to lift his head then move his tongue and so forth. He would then try to pick up a piece of corn with his beak but be unable to actually eat it. 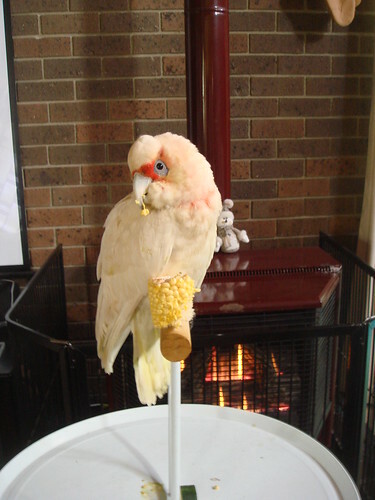 After 2 months of intensive care and lack of sleep on my part, I woke up one day and was stunned to see ‘Jerry’ casually chewing on a corn cob. Then the most amazing thing happened. My husband and I witnessed ‘Leilah‘ grooming him and teaching how to eat different things. It was quite unbelievable. He was then chewing on all kinds of food. He was even able to jump from branch to branch. It was like his motor skills developed overnight. We had started to let them out of their cage once a week to cruise around. We would then lure them back in with heaps of treats. One windy day, we heard a huge thud. We discovered that the wind screen had fallen off in the bird room and the window was actually open. Before we could even comprehend the situation, we realised ‘Jerry’ was missing. He had flown off into thin air.